For my throwback this week I share another polorid photo from my childhood. This one was taken by my dad on a camping trip he took my sister and I on one summer. We were at a campsite in Germisch, Germany. 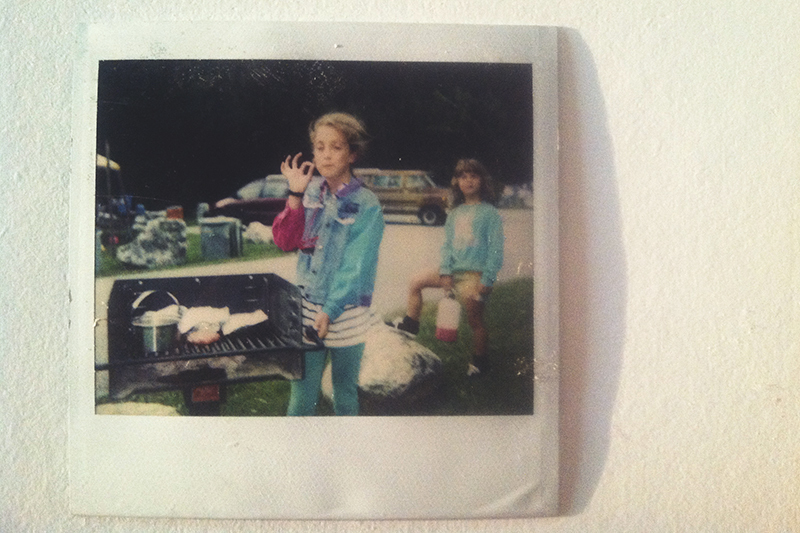 I had just learned how to cook a dinner of veggies and meat in foil over the BBQ at scouts and was ‘showing my dad’ how to do it. 😉 I think another great aspect of this photograph is the fashion my sister and I are wearing from the early 90’s. I still love taking pictures with Polaroid film. and transferring it onto a flat piece of paper. Q: Have you been to Garmisch, Germany? That was the summer I went to Aunt Brenda’s wedding. I love Garmisch AND foil packets. Whenever I make them now it always reminds me of good memories from childhood. Hello to the viewers on this site my name is Mary Cranor i was married to one David Cranor we live and love each other so much am 52 years of age now and we both have 3 grow up children i and my husband love and care for each our marriage last for 31 years so few years back my husband traveled to Europe for business he spent about 6 months there coming home he came with a young lady which i was not comfortable with i tried all my best and at the end my husband was able to send this lady out of the house and she return to Europe we love our selves again just as before,but after few years we have been together again an old friend of of main who traveled to another country Later came back to America he has been a good friend to me and my first lover during our high school days he invite me for denier but i refuse he begged me because it has been long we have meet each other we only chart on Facebook and Skype so granted his invitation this happened on the Christmas night December 24 2013 i went out with him hopefully i will come home that same day i know i was very wrong so getting there i spend lot of time with him and i spend the night with him in a hotel room it was all an incident and i was very assumed of my self when i discovered what i did,but the most painful part of it was my husband friend saw me with this man which i did not even know he went and tell my husband all that happened,when i got home the next day my husband sent me picking my stuff he said is over that he needs a divorce i was heart broken i don’t know what to do i love my husband so much and for the sake of my children i can’t let go just like that,i share my problem with my a friend of my we work in the same company he introduce me to a powerful spell caster who also help her in her own time of need his name is DOCTOR BRAVE he help me cast a spell and my husband later came back to me begging me to come back home that was how the great powerful spell caster helped me in fixing back my marriage and getting the man i love back to me am very grateful to him my husband return back to me after seven days the incident occurred,are passing through problem in your marriage or relationship? the answer is here Dr.Brave is here to help you too just as he have helped me contact him now with this bravespellcaster@gmail.com …So, i will advice you out there to kindly visit the same website http://bravespellcaster.yolasite.com, Thanks.